This Carte-de-Visite's back is adorned with the comments "Lt. Elwes, 1867. taken Edinburgh". "George Robert Elwes, gent., to be Cornet, by purchase, vice Shaw". On May 18th, 1866, we learn from The Times that Cornet Elwes had attended the annual regimental dinner of the 14th (The King's) Hussars "yesterday evening at Willis's rooms, King-Street, St.James's". Among the officers present was also Captain Hon. Frederick Amherst. On March 23th, 1867, he was presented by the Adjutant-General at the Levée, held on behalf of the Queen by the Prince of Wales at St.James's Palace. He will very shortly thereafter be promoted to Lieutenant, as gazetted on June 7th. On the photograph his collar is sporting a Crown - the badge of rank of a Lieutenant. the 14th Hussars were stationned in Edinburgh in 1867. 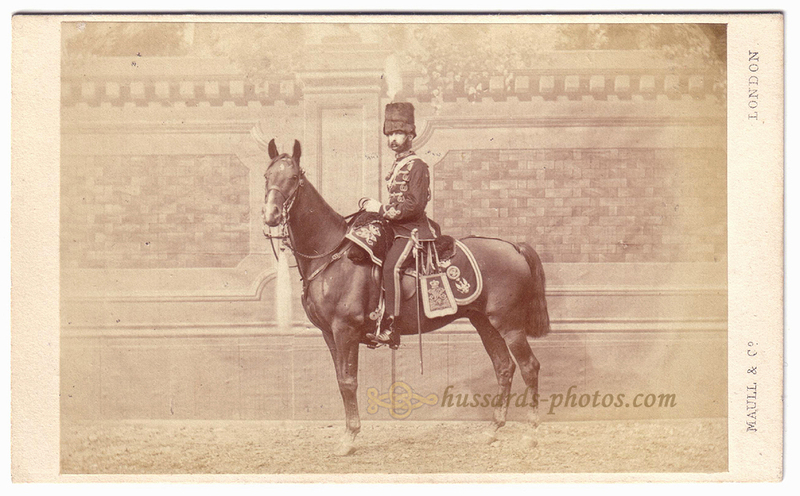 "14th Hussars- Lieut. George Robert Elwes to be Captain, by purchase, vice Thomas Allan Henry, who retires." "14th Hussars- Lieut. Edmund Peel to be Captain, by purchase, vice George Robert Elwes, who retires." Soon thereafter, on August 16th 1870, George Robert Elwes married Selina Mary Ellis-Jervoise (from Herriard Park) in Basingstoke, Hampshire. The marriage, celebrated by the Right Rev. Bishop W. Trower, was witnessed by F.J.E. Jervoise, F. Jervoise and C.H. Elwes, MD. The 1881 census tells us that G.R.Elwes ("Retired Officer Her Majesty's Army") lived with his family in Bossignton. By that time they had three children : Emily Mary (born 1872), John Francis (born 1877) and Alice Evelyn (born 1878). Four servants also lived in the household. He is recorded as a "Justice of the Peace" for Hampshire in 1884, as well as 1902. These records state he had "Property, Bossington, Holdenhurst" and "Freehold hereditaments at Burley". This photograph allows us a good view of the distinctive elements of the 14th Hussars ; Lieutenant Elwes is wearing the typical officers' busby with white plume ; it is specifically characterized by the absence of a boss, a long tradition in the Regiment, that will eventually be officially sanctionned in the 1900 in the Dress Regulations for Officers of the Army. Lieutenant Elwes is wearing the booted overalls. Introduced in 1860, they will be replaced by knee-high boots in 1871. We can also see the regimental officers' dress sabretache pattern ; the Prussian Eagle (the Regimental badge since 1799) is worn below the royal cypher and crown. The Eagle shows better on the shabraque, that kept until it was discontinued (in 1897 for officers - some 25 years before for other ranks) the old Light Dragoons pattern, with rounded corners fore and hind. The charger's throat ornament is white horse-hair, eighteen inches long, with brass ball and socket.